Amid an economic crisis, more people are experiencing food insecurity and turning to emergency food programs to help make ends meet. Amid an obesity epidemic, more people are turning to nutrition experts and research to support behavior change and to combat this epidemic and its impact on society. The common ground of these two problems is in the emergency food supply. The challenge at the Food Bank For New York City is to balance these two concerns and address both hunger and obesity through our network of emergency feeding programs. 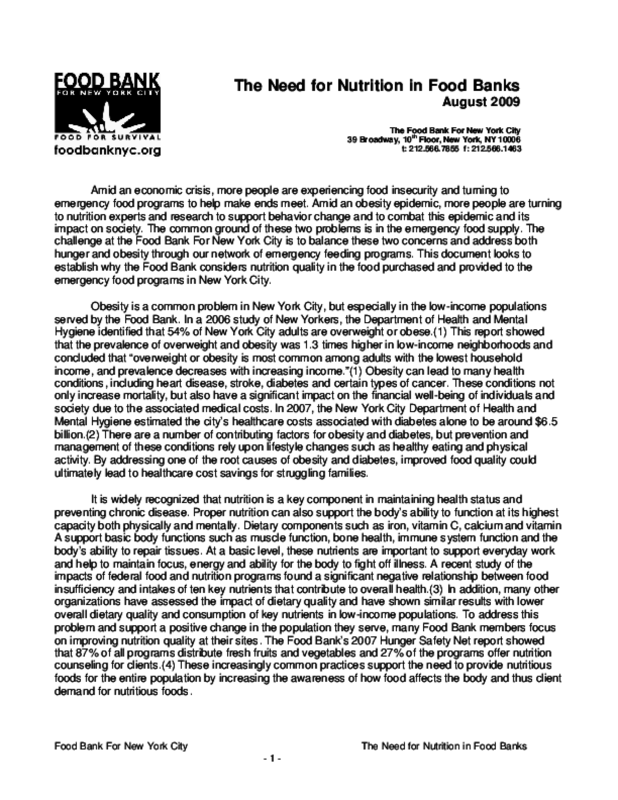 This document looks to establish why the Food Bank considers nutrition quality in the food purchased and provided to the emergency food programs in New York City. Copyright 2009 Food Bank for New York City.